More than 300 kids found out they loved vegetables and fruit in the POP program at the Bridgeport Farmers Market. Copy this program! $102,000 to 53 community teams. Green Thumbs, Dirty Hands and Healthy Kids. Master Gardeners will pair with a PreK-8 school to create a garden that grows produce for the school cafeteria. Children will track production and learn about healthy eating. About 200 students will harvest six 4’x8’ raised vegetable garden beds. They will chart growth, weigh and keep records of the type, poundage and other specifics of the produce grown. Healthy Berkeley: It’s Up To Us! This team will create running and fitness programs in the community and schools by becoming a Road Runners of America (RRCA) Coaching Certification site. At least 10 newly trained coaches will oversee the Offer “mini” grants to at least 4 schools for fitness programs. They will conduct at least two community 5k training programs and operate two RRCA Kids Run the Nation After School Running Programs. Street Medicine. WVU Medical students will help address diabetes and other chronic diseases among area homeless people by offering free clinic days and making street visits at least twice a month. Try This will fund a healthy lifestyle component of this, offering homeless people opportunities to join running groups and other activities that can help control diabetes. They will monitor success. This team will create two school-based gardening programs and expand their 2014 community garden. Beech Bottom Primary, Brooke County, will start with six raised beds. The third-graders will plant vegetables and herbs, using a garden-based curriculum. First and second-graders at Allison Elementary, Hancock County, will begin planting in their greenhouse in January 2016. Weirton Christian Center will expand their community garden in spring. Produce Peddlers. This team will create an affordable fresh-food supply through a CSA program for 20 families in a Huntington food desert. At least 30 Cabell County Youth Report Center youth will set up and maintain the site and will have the option of paid work with the program after they finish their community service hours. They will put in at least 200 volunteer hours to rehab one vacant underutilized HURA lot while they learn about the food business and entrepreneurship. See Huntington Herald-Dispatch article. Daniel Plan Launch Pad Workshops. This team will train members of at least ten churche to offer the Daniel Plan, a popular faith-based healthy living program in their churches. A chef will use fresh local food to teach basics of food preparation and cooking. The team will also provide personal health coaching and keep tabs on the implementation of the Daniel Plan at the churches. ** Try This Huntington. This team will offer hundreds of families a wide range of healthy living activities during the year. A local branch of Hike It Baby, Family Fun Day, Super Snack Day, a back-to-school school event, Christmas and spring break activities, and a healthy Community Baby Shower are among the planned events. 2014 events often attracted more than 500 people, primarily parents and young children. Life on Lots. By October 2016, this team will ask citizens in six at-risk neighborhoods to help create public green space in areas now occupied by dilapidated buildings. In 2015, the team will host active, healthy neighborhood block parties on vacant lots and survey participants about ways to use the lots could be used for green space (park, community garden, etc.). The team will engage at least 300 residents in outdoor play and planning events between May and October 2016. Start Young, Finish Strong. This team will educate preschool children and families at one childcare center on the importance of healthy eating and drinking water. They will implement at least nine new internal policies inspired by the KEY 2 A Healthy Start workshop. In seven new raised beds, all children will participate in growing, tending and harvesting plants. 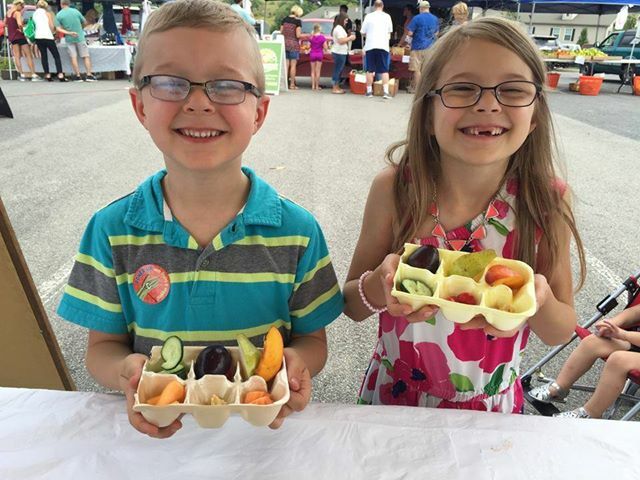 Children ages 2-5 will sell produce at Wild Ramp market. Six-week classes for about 60 families will stress importance of good nutrition and ways to prepare healthy meals. Information about healthy eating and exercise habits will be sent home with children monthly. Calhoun Recreation and Development Corporation Partnership (CRDC). This team will help restart the Calhoun youth basketball league shut down by lack of funding in 2014. They will provide a basketball program for at least100 students in 2nd-5th grades, engage local volunteers to coordinate the program, provide coaching, provide officiating, and other needed support. They will also partner with Calhoun Farmers Market to sell produce at Minnie Hamilton health system, and the Calhoun Ministerial Association will implement the Daniel Plan in at least two churches. The league will create community buy-in for other healthy living initiatives. Get Moving Clay County. This team will recruit area residents who want to help beautify the county while they exercise. At least 20 residents will maintain two trail areas and install mew markers on the trails. They will also survey area women to find out what physical activity opportunities they would like. They will create a Get Moving Clay County walking campaign with at least 50 participants. Fayetteville Outdoor Adventure 4-H Club. This team will provide scholarships and equipment to take low income high school kids on active adventure trips they might not otherwise be able to afford, to expose them the outdoor recreation opportunities available in their area. They will provide at least 10 scholarships in the 2015-2016 school year and will buy outdoor equipment that can be loaned to trip participants. ** Fayette SALS. Second year. This funding will help create a program for youth ages 12-16 to teach them about growing produce, canning produce, raising bees and harvesting honey, and raising other animals. Youth will work in the garden 10 hours a week and sell products at the Fayette Farmers Market to learn about entrepreneurship and help sustain the program. Fayette Compost Pilot Program. This funding will pay for a pilot vermiculture composting program in two county schools. Children will learn to reduce food waste through composting and chemistry. Valuable organic compost to be created for the Farm To School gardens. Two teachers and at least 50 students will participate in food waste recycling. Waste hauled from New River Elementary will be reduced by 35 lbs per week. Food waste hauled from Valley High School will be reduced by 75 lbs per week. More than 70 lbs of organic compost for Farm To School will be created every 3 weeks. The Great Tomato Giveaway. Mount Hope children will learn about gardening and growing food by giving out tomato plants to elementary school children. Gardening lessons will be given in spring 2016, then grape tomato plants will be given 250 Mount Hope Elementary School students, to plant and grow through the summer, and nutrition education classes will be conducted in the schools. ** Committee on Aging Raised Bed Garden. This team will build 10 raised bed gardens at a senior center, engaging 50 seniors in planting and tending the garden. They will create a safe space for a Committee on Aging garden and engage Master Gardeners and Scouts in 100 volunteer hours to build the garden and have nutrition workshops. Power of Produce (POP) Club for Kids. The POP Club at the Bridgeport farmers market will teach at least 200 kids about fresh produce and get them to try new fruits and vegetables. At 13 events, one per week at each market, POP will reach an additional 500 kids. Each child receives POP tokens redeemable for farmers market produce. As a result of child participation in the POP club, the team expects to increase Farmers Market participation of SNAP recipients by 10%. Clarksburg Growing Together Through Doing MORE & Broadway Community Garden. Juvenile drug court offenders will help two community organizations create a gardening and healthy eating project. Participants and at least 10 drug court participants will create two Clarksburg community gardens, engage five community members to mentor youth as they do their community service. The garden will provide five area homes with regular fresh produce. Riverfront Park Wellness Path. This funding will help build a walking path in the Ravenswood Riverfront Park for community use. They commit to build an 800’ X 6’ ADA-accessible walking path in the Ravenswood Riverfront Park; install 11 light posts to ensure a safe environment for day and evening walkers and runners; engage 15 community volunteers for 100 volunteer hours each to construct the path and install the light posts. Country Kids Daycare & Child Development Center Community Garden & Outdoor Learning Environment. A daycare and a local church will partner to build 10 raised garden beds to be part of the daycare curriculum. The team will also offer cooking classes for congregation members and daycare families, using garden produce. The daycare staff will complete a Nutritional and Physical Activity Self Assessment for Child Care (NAPSACC) training. Other parents and church members will prepare the ground, fence and planting beds. All 95 daycare children will will spend time in the garden daily, learning from a garden-based curriculum. Healthy Community Arts. This team, led by the East End Family Resource Center, is adding arts and healthy living components to their community garden efforts and overall program. They hold programs in the garden and in their center and host 12 family fun nights with healthy living activities. In spring 2016, the team will start an afterschool Brains and Brawn weight-loss and literacy enrichment camp/program that serves 40 at-risk youth children in low-income housing projects ages 8-18. They will create a similar camp in summer 2016. engaging participants in fitness activities and reading. They will achieve or exceed 5,000 total youth fun fitness and 5,000 reading hours by the end of August. Get Off Your Bum and Drum This project is being redesigned. This team will engage at least 100 underserved young people in a free healthy living curriculum that incorporates music and drumming with healthy lifestyle education. Partners: WVSU Extension; WV Promise AmeriCorps VISTA; Keep Your Faith Corporation; Rock Lake Community Life Center; WVSU Music Department. Try This funding will help create a natural play area and outdoor classroom for the local elementary school. Volunteers will put in 350 hours of volunteer time to build it. At least 115 children from Saint Patrick Elementary School will use it as an outdoor classroom. Additional gardening areas will be provided for the Lewis County Family Resource Network Food Pantry. Adult Exercise Equipment at Jane Lew City Park. This team will install adult exercise equipment in the Jane Lew City Park to help address lack of a town gym or fitness center. They will advertise and encourage use of the equipment, in conjunction with Jane Lew Community Center and will form a Senior Citizens Exercise Club with at least 25 members. They aim to increase usage of Jane Lew Park by 20% by June 2016. ** Renew Rebuild Unite Cora-Shamrock. – second year. Building on their successful 2014 gardening grant, this community team will restore a greenhouse and help area residents learn to garden. Local families will plant, weed and improve the community garden, installing new fences and building a storehouse. At least five teachers and 50 students will help with the greenhouses, as will another three community organizations. Blackshere Youth Garden Program. This team is will expand the garden and create indoor grow labs for Blackshere Elementary’s gardening curriculum. They will build five additional raised garden beds and construct hoop cold frames for 10 raised bedsto extend the growing season. They will equip a mobile food prep/cooking station so kids can learn to prep the produce for cooking. Super Healthy Sunbeam Families. This team will expand their school garden and curriculum and create a natural playground to serve children of many ages. They will implement at least nine new policies that reflect the goals set in the KEYS 2 A Healthy Start workshops by October 2015 using NAP SACC (Nutrition and Physical Activity Self-Assessment for Child Care). They will create a natural playground and four new raised beds and host in-school nutrition workshops and evening healthy cooking workshops for parents. This team will build a family/community garden at a public housing development. The garden will supply low-income families with 300 pounds of fresh produce per year, and at least 25 community members will construct and plant the garden. Healthy Habits. This grant is being renegotiated. In spring 2016, this team will present programs to help educate at least 670 children about good nutrition. They will teach childcare providers about gardening and preparing healthy meals. To encourage the families involved in the childcare program to get involved with gardening, they will start a community garden and provide gardening tools. This team will create a healthy nutrition program at the New Creek School in which all children will participate in a morning play period and take their water bottles with them to class. They will enjoy 60 minutes of physical activity per day and will be encouraged to walk between 0.25-1 mile daily. They will receive the Healthy Hearts for Kids exercise program after school and get fruits and vegetables instead of packaged snacks. Evening fitness classes will be provided in the school gym for parents, families and community members. The grant will pay for supplies. This hospital-school team will implement the 22-session Group Lifestyle Balance program to help people with Type 2 diabetes manage their disease. They will train coaches and conduct an advertising campaign to increase pre-diabetes awareness. One GLB program will be held at a worksite. Another will target women with a history of gestational diabetes, and a third will be a faith-based wellness initiative. The grant will pay for project materials. Monongalia County Diabetes Coalition. This team will start a diabetes coalition to serve area residents by providing information, screening, prevention and management and raising awareness about diabetes. They will -create a website, publish a community resource guide, offer two non-invasive diabetes screenings assessments and two lifestyle programs. Many area parents drive long distances home after picking children up. They often stop to purchase an unhealthy snack at a convenience store. This team will teach parents and children about healthy snacks that travel well. The project will provide healthy snack workshops for parents and will provide actual “Sail Home healthy Snacks” each day. They will host a celebration at the end of the year featuring foods made from the garden. 12 Habits of Wonderful People. This team is building a three year effort to encourage healthy habits in Morgan County. This year, they will create or partner with local races for 12 Monthly Color Walks, aiming for 600 people per year. Each month, they will sponsor a walk from the center of town to a different health agency to learn about health/wellness services and share an activity. Childcare will be provided with healthy snacks and exercise. Toolbrary. This team will create a “Toolbrary” – a truck equipped with enough garden tools, equipment and learning resources for 30 people, that can be driven to area community gardens, schools, elderly apartments, and other community sites. The Toolbrary truck will significantly lower the cost of creating a garden for area groups. Using the Toolbrary, Grow Ohio Valley will get at least 400 students involved in gardening. They will conduct a tool/resource drive twice a year. MOOVE-IT! This team will build a quarter-mile-long walking track around the football field at Marlinton Elementary School, which will be incorporated into daily routines and lessons for about 240 elementary school students as well as walking programs for the larger community. They will place members on the Marlinton Elementary Wellness Committee and will research and apply for other grants to expand the project. ** Linwood Pavilion Expands! This team will add a grill and outdoor hand washing stations to the community pavilion at the child care center, so they can host community cooking demonstrations and sales, expand food offerings at the daycare and make pavilion rental more attractive, with a goal of creating a sustainable revenue stream. They expect a 20% increase in attendance at the Linwood Farmers Market. Children in the summer feeding program will be able to participate in harvest and preparation of grilled fresh vegetables. ** Healthy Harvest Community Garden. This team will develop a one-acre community garden to grow produce for the local food bank, which serves approximately 425 per month, but most of the food they receive is packaged. This garden will change that. The group will also develop a Healthy Community Coalition and steering committee. Bicycle-Pedestrian Connections & Healthy Elkins Campaign. This team will support a newly designated Elkins Bike Route with signage; public education and outreach; and community biking events. The team has committed to add two blocks of pedestrian routes and 12 miles of bike route. They expect to increase bicycle-pedestrian customer activity at downtown businesses, using survey to measure. They will build the Healthy Elkins team to 20 members and aim for 1,000 Facebook likes by the end of 2015. Camp Pioneer Walking Trail. This funding will help build a half mile walking trail near Beverly for community use. The team plans to engage local students and youth groups to build the trail and engage the local community in Fun Walks to promote the trail and spread awareness of the health benefits of walking. Getting Kids Moving in Taylor County. This child care center will expand its outdoor area and create separate areas based on children’s ages, allowing for 1-4 more hours of active time in the school day. The center will host an education hour for parents every six months, to help them understand the importance of physical activity in their children’ development.